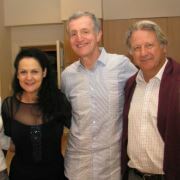 Pictured from left: Dr Victor Wayne – President, Australian Friends in Vic., Uri Levine, Dr Harry Perelberg - Vice President, Aus. Friends in Vic. The Australian Friends of Tel Aviv University marked TAU’s 60th anniversary with the first of an “Innovation and Entrepreneurship,” series aimed at bringing together top Israeli and TAU innovators with local business and community leaders, to share ideas and develop new ventures. This first in the series featured TAU alumnus Uri Levine, co-founder of WAZE, the world's largest community-based traffic and navigation app which was recently acquired by Google. 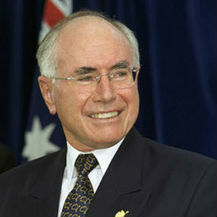 Mr. Levine toured Australia and was guest speaker at a number of events. The series kicked off at a lunch hosted by NSW Friends President Andrew Whitten attended by the elite of Sydney’s venture capital and high-tech investor community, as well as TAU alumni, who appreciated hearing about Uri Levine’s know-how and expertise. In Melbourne a sold-out luncheon event featuring Mr. Levine was attended by 150 and hosted by the University of Melbourne and dedicated to AISEP – Australia-Israel Scientific Exchange Program, as well as AFTAU’s fund for supporting Australian students and researchers to come to TAU. Guest of Honor was TAU Honorary Doctor Marc Besen, AC, who was presented with a certificate in recognition for his friendship and generosity towards TAU and higher education in general and his longstanding support for the State of Israel. Mr. Levine’s Australian visit also included an exclusive luncheon event with the Australia-Israel Chamber of Commerce in Melbourne attended by 30 top business executives as well as a large cocktail party attended by Melbourne’s young entrepreneurs. AFTAU’s first event in Perth, Western Australia was held in collaboration with the Australian-Israel Chamber of Commerce and held at the Duxton Hotel, honoring Mr. Ike Eilon, a pioneer of Israel’s commercial shipping lines and a new TAU Friend. Pictured from left: Mr Boaz Nol, TAU Australian representative; Ms Rachel Cooke, Consul General, US Consulate General Perth; Mr Ike Eilon, Managing Director, Capricorn Maritime; Mr Vince Troth, WA Regional Director, Schneider Electric; Prof. Margaret Jones, Director, Office of R&D, Edith Cowan University; Stuart Silbert OAM, Australia-Israel Chamber of Commerce (WA); Larry Lopez, Vice President, AICC(WA) and Partner, Australian Venture Consultants; Uri Levine, Founder, WAZE; Mr Graham Laitt, President of Australia-Israel Chamber of Commerce (WA); Meir Buber, TAU Senior Resource Executive for English speaking countries; Prof. John Finlay-Jones, Deputy Vice-Chancellor (Research), Edith Cowan University; John Cluer, Chief Executive, Australia-Israel Chamber of Commerce (WA); and Mr John Schaffer, Chairman & Managing Director, Schaffer Corporation.